The Fantasy Football Season is half way over and after week seven, many of you know whether or not your team has what it takes to make a playoff push. We're sure plenty of you have teams on the bubble and are looking for a little advantage down the stretch... Well if you're in need of RB advice, this is the article for you! We've done an extensive analysis of the remaining seven weeks of every starting RB's schedule to find which ones may be nice targets for the coming playoff push. Now there are always match-up proof RBs (ie. Forte, Bell) but there are some interesting waiver wire RBs that could really help a team that hasn't had the greatest production from the position this year. Take a look. *Doug Martin, Jonathan Stewart, and Charcandrick West sit atop the playoff push rankings. *Adrian Peterson may have some tough sledding to do in weeks 13 and 14. *Rashad Jennings and Latavius Murray may need to be avoided for most of the remaining season. 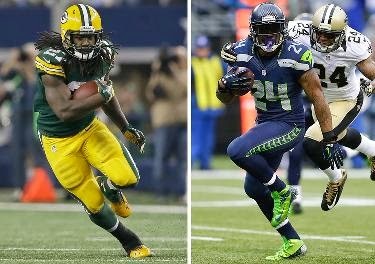 *Marshawn Lynch will play weeks 10 through 14 in bad weather games, which will likely be a good thing for him. * Forsett, Hillman, and Ingram play four home games down the stretch, and may be potential buy low prospects.